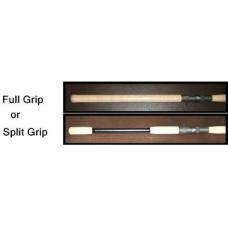 These rods do not ship from Musky Tackle Online, but rather direct from Tackle Industries. Rods will ship direct from Tackle Industries, typcially in 1 to 2 business days from the time the order is placed, using Spee Dee Delivery in the midwest and Fed Ex in the rest of the country. Occasionally, they may also use the USPS for shipping. Our FREE shipping offer over $75 applies to the prices shown here on these rods as well. (Free shipping in the Continental United States only) Any other products ordered from Musky Tackle Online when combined with a rod purchase will also ship for free no matter the size of the order even though it will ship separately. *** We are now able to have TACKLE INDUSTRIES rods shipped to Canada via FedEx. If you have other items on your order, additional shipping charges may apply, as shipments would occur from more than one location. Should you ONLY have rods from Tackle Industries on your order and nothing else, there will be no additional shipping charges from what is shown during your checkout. All Tackle Industries Rods are covered by a limited lifetime warranty. You must fill out the warranty card found below for the warranty to be covered. Our rods are covered by a limited lifetime warranty against manufacturing defects in workmanship or materials of construction. This warranty is good for the original owner and non-transferrable. You must fill out our warranty card and mail it to us at the below address along with a copy of your sales receipt or proof of purchase for our warranty database within 30 days of purchase. If not, your rod will not be covered by our warranty program. This warranty is limited to repair or replacement of the rod and does not cover direct, indirect, consequential, incidental or any other type of damage resulting from the use of the product. ONLY manufacturing defects are covered. Most manufacturing defects will occur in the first few uses of the rod. Please do not ship rods broken by angler error. Accidents such as; stepped on it, truck door crushed it, dog chewed it up, wife broke it, cleaned out gutters with it, etc are not covered by our warranty and we will not replace the rod. Only defects in workmanship and materials are covered. Any modifications to rods will null and void all warranty coverage. Broken guides are not considered a warranty defect and are not covered under the warranty. Simply ship the damaged rod, prepaid and insured, along with a check or money order for $50, when returning product for warranty evaluation. The lifetime original owner warrant applies to all retail purchased rods and for the original owner only. Tackle Industries reserves the right to repair or to replace the rod for a warranty fee of $50.00 USD plus shipping and handling, and Tackle Industries Rods reserves the right to make that determination. Rods that become damaged due to normal wear, accident, misuse or neglect are not covered. 1) Copy of your original warranty card (please make a copy before you send us your warranty). 2) Copy of your original receipt or proof of purchase. 3) Cashiers check or Money order in the amount of $50. 4) If you wish to have Tackle Industries invoice you for the $50 plus the cost of a shipping tag please e-mail us for payment instructions. We do have special rates with carriers. ***If you do not follow any or all of these instruction we will not honor your warranty. In no event shall Tackle Industries be held liable for incidental or consequential damages due to breach of this warranty or other warranties implied by law. Some states do not allow limitation on how long an implied warranty lasts nor do they allow for exclusion of incidental or consequential damages; therefore, the above stipulated limitation and/or exclusion may not apply to you. Should we decide to replace the damaged product, but no longer offer that model, we will replace it with what we determine to be the closest comparable model from our current product line. Rods purchased from liquidation retailers, liquidation sales, eBay or other auction sites do not qualify for warranty coverage. Only full priced sold rods are covered under our warranty program. In the event we discontinue rod production and sale of our Tackle Industries rods all warranties are null and void.